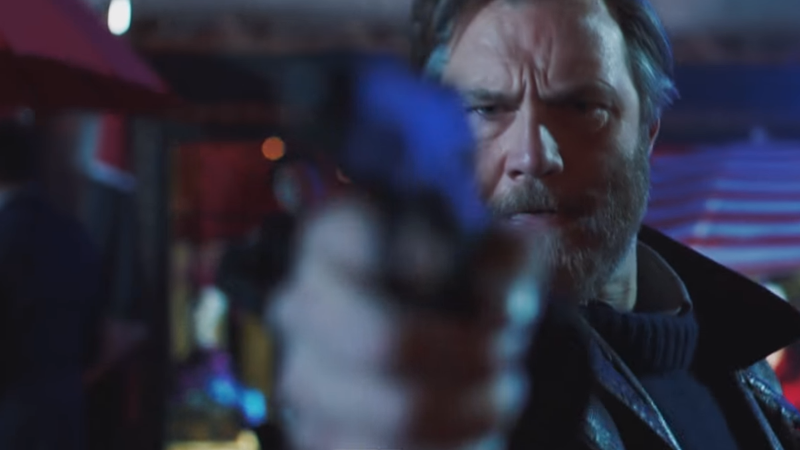 David Morrisey wielding a very out-of-focus pistol as Tyador Borlú in The City and The City. The BBC is taking a crack at adapting one of China Miéville’s most beloved and mindbending novels, The City and The City—and our first look gives us a bit of insight into how we’ll see two wildly different societies mix... even when they’re not supposed to. The four-part series casts The Walking Dead’s David Morrissey as Tyador Borlú, an inspector from the city of Besźel, a worn down city-state that actually occupies the same physical space as the city of Ul Qoma, a similar (but more wealthy) city that has a completely different language and culture. The citizens of both cities are taught from childhood to consciously ignore the existence of the other city, creating two distinct societies that mostly live blissfully unaware of the other. “Breaching” the barriers between the two cities by ignoring the separation is a serious crime—so when a young girl from Ul Qoma shows up dead in Besźel, Borlú is thrust into an investigation that finds him not just entering the other city he’s been taught all his life to ignore, but hunting down a legend that there may even be a third city in the mix altogether. The City and The City is one of Miéville’s most surreal novels, so it’s going to be interesting to see how it translates to the small screen—UK-based fans won’t have to wait long to find out how though, as The City and the City begins on BBC 2 April 6. Unfortunately, there are no details on if it’ll be making its way to US shores just yet.